On Sun. Nov. 30th, a US National Bible Contest for Adults took place in New York. A tape-delay of the event was broadcasted by ShalomTV/JBS, and complete video of the event has been posted on their Youtube Channel. Read about it in the NJ Jewish News. The International Chidon Finals for Adults will take place this Tues., 12/23, at 6PM Israel time (11AM in the US East Coast) and will be streamed by Israeli Channel 1 & Israeli Educational TV. The event should be added to the Israeli Educational TV YouTube Channel and archived there. Best of luck to the Americans who will be competing in the International Finals! US Chidon for Adults champion Yair Shahak (center) flanked by Alexander Heppenheimer (left) and Cantor Avraham Horovitz (right), who tied for 2nd place. 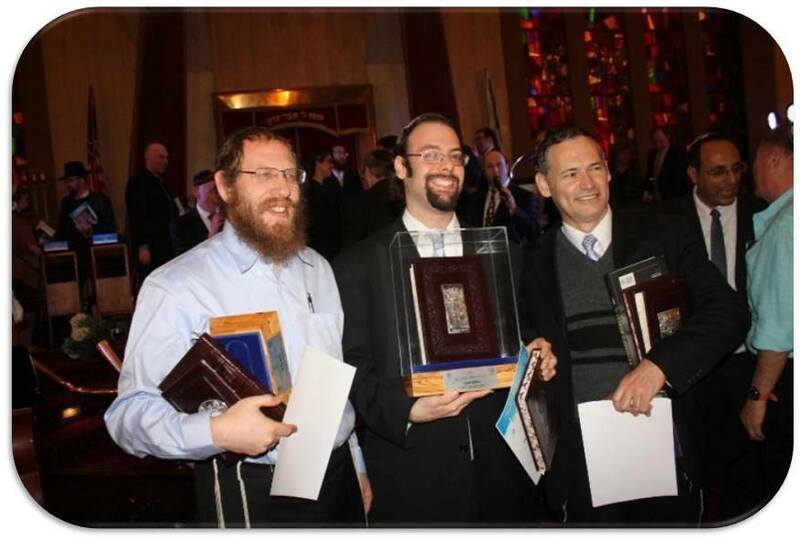 You are currently browsing the US Chidon Ha-Tanach blog archives for December, 2014.